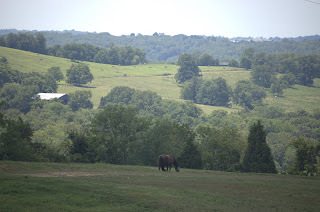 On his way to San Antonio, TX, Kevin made a stop in Kentucky to visit the Fugh's. He was with his Mother and his Aunt. We had dinner at a restaurant in Frankfort and needless to say we enjoyed our visit. 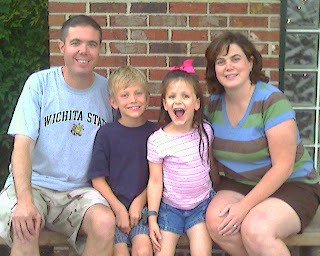 Kevin, as most of you know, is a special part of our family ever since we worked together at St. Luke. Kevin just got back from a 6 month tour of duty in the Middle East and is moving from Kansas to Texas to work with the Chaplains Office for Airman/Airwomen in the Air Force. We love Kevin dearly and know that God will use him mightily as he serves Him and our country. 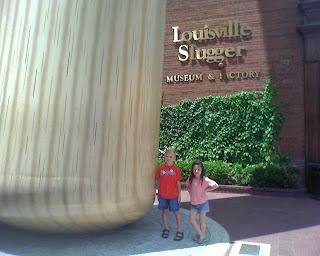 Today, the kids and I went to the Louisville Slugger Museum and Factory while Lisa was at a meeting. We took the factory tour and saw all the bats that the factory makes. John Arthur-who loves baseball-was excited to see the Major League bats and even hold some of the bats that are sent to the players. By the way, that large thing to their left is the world's largest bat. It leans against the outside of the building. It is 120 ft high and is 9 ft in diameter where the kids are standing. We hope all is well with you and your family. One of the things that Anna loves to do more than most anything else is take care of animals. They may be her stuffed animals, others' pets, or our puppy--Teddy. 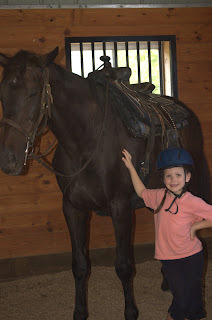 So, she has been in her element this week at Horse Camp which is housed on the campus of Asbury College. This is her horse Foreigner whom she has been taking care of all this week. She has to groom him, brush him, and feed him. Needless to say, she is the youngest one there, but this has not hindered her one bit. Those of you who know Anna will appreciate her tenacity and determination to be the best and this has not been any different this week. Enjoy the pictures and be sure to share what has been going on in your lives as well. I was visiting with someone the other day and the topic turned to why I was so sure that Christ was resurrected from the dead. Well, I was not an eyewitness to the event, but one thing that I know for sure is the testimony of those who were eyewitnesses. Lay aside their verbal testimony, what strikes me as the most revealing testimony is the testimony of their lives. All of the disciples (with the exception of Judas Iscariot who committed suicide and John who was banished to Patmos) gave their lives for this fact: That Jesus was God and that He died and rose from the dead. I am a passionate person; however, I will not give my life for a lie. I may lie about something, but when push comes to shove, I will not die for it. At the last moment I will recant and admit the truth. I have to believe that you would do the same thing. If this is true, then, why would we think that the disciples would be any different? If they were furthering a lie, they would not have given their lives for such lie. They would have also recanted. Their testimony with their lives is a significant testimony that is hard to overlook. But, these disciples were not the only ones who gave their lives. Through the centuries, thousands of men and women did the same thing as recorded in Foxe's Book of Martyrs and church history. They lived their lives for God and they gave their lives for the Truth. Without the threat of death here in the United States for our religious beliefs, it may be easy for many of us to say that we would die for Jesus. However, what God may want from us now may not be a willingness to die for Him, but a willingness to live for Him. Romans 12:1-2 is a passage that encourages us all to be living sacrifices for God. With this truth in mind, let's not only be willing to die for Him but live for Him as well! What do you think? We have been trying to grow tomatoes for years and we finally got some ripe ones! Now, I am not a tomato lover but John and his mom are. 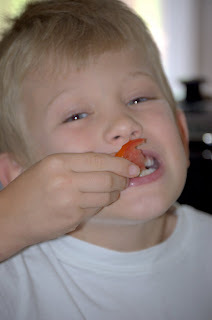 You can see here John is feasting on his one, small, ripe tomato and he is loving it! The late Dr. J. Vernon McGee had a radio broadcast called Through the Bible. The radio broadcast was centered on a five year, verse-by-verse, study through the entire Bible. During a broadcast on John 3, he came to the famous verse 16 and asked the question, "What does it mean to believe?" Is it a state of mind? Is it a one time decision? Or is it something more? He defined "to believe in Jesus" as something more that an intellectual decision. When I believe in Jesus, I trust Him in such a way that if He were to let me go, I would helplessly fall. Dr. McGee went on to liken this to a chair. If I were to stand next to a chair and say that I believe that the chair would hold me yet do not actually sit in the chair, I am not placing any trust in the chair. It is not until I sit in the chair that I am "believing in" or trusting the chair. Standing next to it, I can say whatever I would like--it means nothing until I place my trust in the chair. It is the same way with belief in Jesus. If I stand on the outside of faith and say that I believe in Jesus then I am placing no more trust in Him than I was when I was referring to the chair. It is only when we rest in Jesus' arms and place our trust in Him that we are believing in Him. If He were to let us go, we would helplessly fall. The reality is that there is a God who loves us and will not abandon us (Hebrews 13:5). We must move past mere intellectual thoughts about God and fully trust in Him. This is my first attempt at anything like this--a blog or anything similar. But, since we have several people asking about us, we thought this would be a great way to share what is going on in our lives with the people we love. I am not sure what will be included in this. Sometimes there will be some bragging about our children; sometimes there may be some pictures of trips we have taken; sometimes there may be prayer requests or devotional items. So, sit back and enjoy the ride. This photo was taken this past weekend. My brothers and I (there are four of us) went on a canoe trip with some friends. 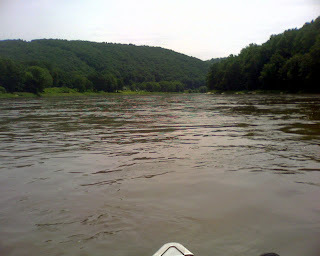 It was a 30 mile trip down the Allegheny River in Northwestern Pennsylvania. This is a view from where I sat. Beautiful! We camped along the coast and rowed during the day. Luckily the water levels were high and the river was faster than normal, so we didn't have to work as hard. Well, this is all for now. Be sure to keep in touch and leave comments as you see fit. Blessings to all!